A couple of weeks ago, fellow wanderlust friend Benj announced that his blog visitsagada.com turned 3. This got me to muse about my own blog turning 3 in February. But then I did the math and realized it’s actually turning 4. Today! The beginning of 2007, I’ve decided to travel to Europe that summer. Filipino passport and all, I needed an itinerary and I couldn’t decide on one and got so overwhelmed with planning! When I was in school, I’ve developed a working tactic of jotting things down to organize my thought. And this brought me to start a blog 4 years ago. My first blog was set-up in travbuddy.com and the very first entry was aptly titled “visualization“. As promised this blog saw me through my preparation and the Europe trip, at least a good part of it. I was inspired to update during my travel because my family and friends were following me. The travbuddy.com set-up is organized on a per trip basis. So after coming home from Europe, I wasn’t very motivated to continue writing. So while my travelful life continues in 2008 — 3 weeks backpacking South China, 2 weeks train-setting North to South Japan, New Years Eve in Macua, local destinations Davao, Camiguin, and various scuba diving trips — you won’t find them all in my blog. After reflecting on my travels that never got written, I decided to purchase my domain wanderlass.com on September of 2008. 2009 was very interesting and adventuresome. This is the year the wandersoles — a 5 girl travel team — was born. Yeah we did. We came up with a group name ala Spice Girls! Hahaha. We were scuba diving girlfriends who constantly find ourselves on the same dive trips. So we decided to make it an official group, but now officially dissolved as everyone got busy with their own thing. We even had a grand plan of traveling the world together to scuba dive. At this time, I’ve been more committed with my blog, although got lazy towards the end of the year, so one week South Korea and 3 weeks US & Canada during fall were not documented. Instead of the Big Trip, 2010 became Visit Pilipinas year for me. 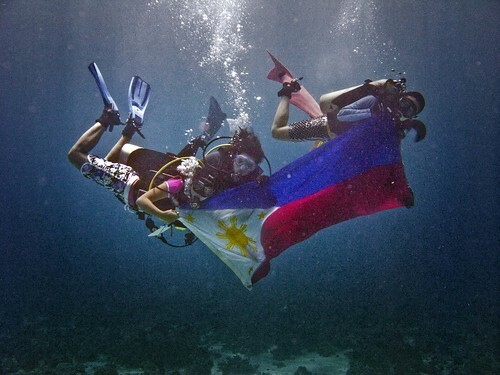 It was the year of my 100th dive and crossing off Tubbataha, Coron, and Malapascua off my diving list. It was also the year of unexpected trips: Batanes and Zamboanga. I’ve happily upped my Lakbayan score to C+. I also finally visited Singapore for the first time, my only out of country trip. As for my blogging, I’ve pretty much kept it up to date and have made the big move to wordpress from blogger. Contest — all serious blogs conduct contest. So I’m going to have one too! It’s going to be really simple with cool prizes. Yes, there’ll be more than one winner. And no worries, no begging/bugging friends to like your entries. I’m still deciding on whether to conduct it here or in facebook. Finally, I’ve been looking for a fellow Filipina who is planning a gap year abroad. I’ll stay posted. I want to find out your plan for the travel visas. As you know it is such a pain for us since we need to apply to every country. Congrats on being 4!